Source: Wells Fargo Investment Institute; January 10, 2019. Forecasts and targets are based on certain assumptions and on our current views of market and economic conditions, which are subject to change. The strategists at Wells Fargo Investment Institute share what investors may see in the year ahead. Can this long recovery and the bull market continue through 2019? June 2019 completes 10 years of economic growth. For most of this expansion, the pace of growth has been slow, but low inflation contained costs and propped up profit margins. As long as earnings continue to grow and inflation stays benign—as we expect—then equity market valuations can remain firm and, in our opinion, equity markets should make new highs in 2019. So, even though we may see more periods of market volatility, our work suggests we are still a long way from recession. Without a recession in our sights, we think U.S. equities should continue to perform well. And while the economy and earnings are still growing, we view market swings not as the end of the cycle or the bull market, but potentially as good opportunities to deploy cash—even incrementally. Globally, we believe developed and emerging equity markets could see headwinds start to fade, which could result in positive returns in 2019. What are the opportunities and risks with rising interest rates? The long cycle should put more upward pressure on bond yields, and create more volatility in credit markets. And so we prefer moving up in credit quality. What’s more, rising long-term yields make us favor shorter-term fixed-income investments. And we still see opportunities in municipal credit markets—thanks to limited supply, increased investor demand in high-tax states, and greater financial flexibility among municipal issuers. We believe most investors should hold some fixed income in their portfolios for its generally more-stable returns and ability to generate income. Higher interest rates are normally good for savers, but they can put stress on weaker borrowers and may lead to some credit downgrades, and possibly defaults in the bond market. We suggest holding higher quality and shorter duration fixed income assets in investment portfolios. How should investors prepare for an increase in market volatility? In the last decade, it was easy to watch equities and bonds rise together, with low volatility, and to see the U.S. outperform international markets. But now the end of that time may have arrived—it’s the “end of easy.” That doesn’t mean the cycle is over but, from now on, investors may have to do more homework: To build a truly global portfolio, to rotate among sectors, and to keep bonds in the portfolio. 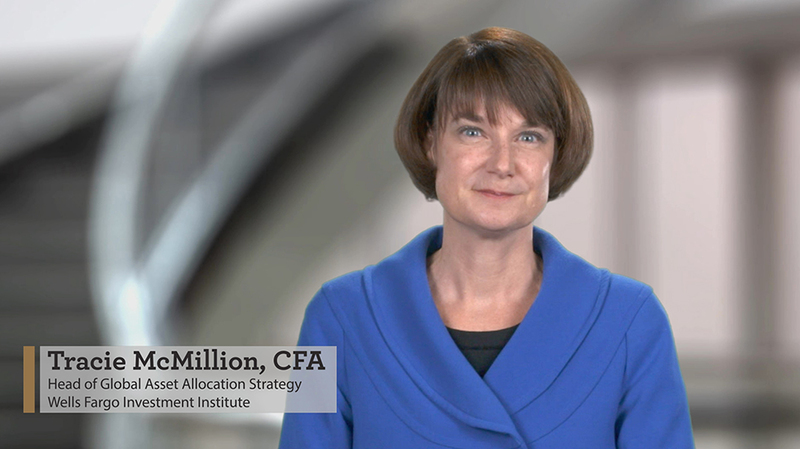 Investors should prepare their portfolios for continued volatility in 2019. A well-diversified, global portfolio that includes all four asset groups—equities, fixed income, real assets, and alternative investments—can help to smooth market volatility. Investors can take advantage of volatile markets by rebalancing into assets that have declined in price and may present attractive values. For more information on how your portfolio will be affected by economic trends in the coming year, download our Wells Fargo Investment Institute report—2019 Outlook: The End of Easy. Asset Class Risks Each asset class has its own risk and reward characteristics which should be evaluated carefully before making any investment decisions. The level of risk associated with a particular investment or asset class generally correlates with the level of return the investment or asset class might achieve. Both stocks and bonds involve risk and their returns and risk levels can vary depending on prevailing market and economic conditions. Bonds are subject to market, interest rate, credit/default, liquidity, inflation and other risks. Prices tend to be inversely affected by changes in interest rates. Foreign investing involves greater risk than those associated with investing domestically including political, economic, currency and the risks associated with different account standards. These risks are heightened in emerging markets. Real assets are subject to the risks associated with real estate, commodities and other investments and may not be suitable for all investors. Alternative investments trade in diverse complex strategies which may expose investors to considerable risks. Be sure you are aware of, and understand all risks associated with a particular investment before investing. Rate-sensitive asset classes and sectors such as REITs and most fixed-income securities, and higher-dividend equity sectors such as Utilities and Materials, may face headwinds from rising rates. However, as this chart shows, equities can still post strong performance late in a cycle when interest rates are rising. Sources: Morningstar Direct and Wells Fargo Investment Institute, November 19, 2018. For illustrative purposes only. The S&P 500 Index is a market capitalization-weighted index considered representative of the U.S. equity market. The Bloomberg Barclays U.S. Aggregate Bond Index is a broad-based measure of the investment-grade, U.S.-dollar-denominated, fixed-rate taxable bond market. Index returns are not fund returns. An index is unmanaged and not available for direct investment. Past performance is no guarantee of future results. There is no guarantee any asset class will perform in a similar manner in the future or in other rising rate environments even if it has done so historically. Both stocks and bonds involve risk, and their returns and risk levels can vary depending on prevailing market and economic conditions. Bond prices fluctuate inversely to changes in interest rates. We continue to prefer equities over other asset groups and anticipate broader opportunities globally and among U.S. equity sectors. In U.S. equity markets, we rank opportunities in U.S. large- and mid-cap equities over small-cap equities. Consider reducing exposure to those securities that are sensitive to rate increases, such as long-duration fixed-income securities and developed market debt. Consider reducing high-yield holdings as well. We favor shorter-maturity positions while rates are rising. We expect favorable income-oriented opportunities from emerging market debt and preferred securities. We believe the dollar will stabilize and even weaken somewhat, providing a potential boost to international assets. International markets should benefit from steady global growth in 2019. * Diversification does not guarantee investment returns or eliminate risk of loss. Greater market volatility in 2019 signals an end to unprecedented low volatility and above-average returns across equities, fixed income, and currencies. We favor deploying cash selectively as volatility can create new potential opportunities in commodities and some equity markets. Can strong economic growth continue? We believe U.S. economic growth will moderate and that inflation will remain stable. In our view the likelihood of recession rises beyond 2019. Greater swings in economic activity, coupled with the risks related to Federal Reserve or trade policy missteps, raise the likelihood of higher financial market volatility. We anticipate somewhat slower growth in Europe as the U.K. prepares for Brexit and Germany’s economy enters the latter stages of its expansion. Uncertainties surrounding tariffs are a concern for China, yet we expect supportive fiscal and monetary policy to help underpin the country’s economy. We believe that emerging market economic growth should accelerate, and growth rates in developed economies outside the U.S. should slow toward their long-term trends. Tight labor-market conditions finally have ended years of wage stagnation, and employers are finding it difficult to hire qualified workers. Yet, the pace of the U.S. economy may not be so easy to maintain. Sources: Wells Fargo Investment Institute and Bloomberg, October 31, 2018. Monthly data from January 31, 1967, to October 31, 2018. Note: The dashed horizontal line shows the October 2018 level of 1.63 million unemployment claims. We believe the equity markets have room to rise in 2019 due mostly to record-high EPS expected in the coming year. The end of easy means, in part, that more historically average volatility has returned to financial markets. However, we believe that investors should not fear the changing trend, so long as low inflation and solid earnings-per-share (EPS) growth continue. See the chart below for more. We are most favorable on the Financials and Industrials sectors. We also find attractive opportunities in Consumer Discretionary, Information Technology, and Health Care. International equities, especially emerging market equities, look most attractive based on growth and valuation. They also should benefit from marginal U.S. dollar weakness, rising corporate capital expenditures, and growing global industrial production. Even if EPS rises more slowly late in a cycle, it can still reach higher levels that, in turn, drive higher equity prices. As shown here, the S&P 500 Index typically rises in proportion to its EPS growth. Sources: FactSet and Wells Fargo Investment Institute (WFII), as of October 31, 2018. Quarterly historical data; forward EPS show estimates of EPS over the coming 12 months. The point for December 2018 indicates the EPS expected for year-end 2019. Logarithmic scaling is used so that two equal percent changes have the same vertical distance on each scale. Earning per share (EPS) is the portion of a company’s profit allocated to each outstanding share of common stock and often serves as an indicator of a company’s profitability. The S&P 500 Index is an unmanaged index generally considered representative of the U.S. stock market. The Federal Reserve (Fed) will likely end its rate-hike cycle in 2019, but there is a risk that the Fed might take it too far. In our opinion, investors should position fixed-income portfolios defensively: taking credit quality higher and being below benchmarks for duration and maturity. We favor the emerging market asset class (dollar-denominated sovereign debt) for attractive income opportunities. We expect annualized returns to remain around the 5% to 6% range. Sources: Bloomberg and Wells Fargo Investment Institute, November 19, 2018. Weekly data from January 08, 1971 to November 16, 2018. For illustrative purposes only. An inverted yield curve occurs when the yields on bonds with shorter durations are higher than the yields on bonds with longer durations. The difference between the 10-year and the 1-year Treasury yield measures the spread between short- and long-term interest rates.The Ten-Year Treasury Constant Maturity and the One-Year Treasury Constant Maturity Indexes are published by the Federal Reserve Board and are based on the average yield of a range of Treasury securities, all adjusted to the equivalent of a ten-year maturity and the equivalent of a one-year maturity. Yields on Treasury securities at constant maturity are determined by the U.S. Treasury from the daily yield curve.